Want to learn how to cook prime rib on the grill? You are at the right place, and if you follow these easy steps, the end result will be both delicious and impressive. The video at the bottom of this page does a pretty good job of showing the process. I used a simple "wet rub" that is made up crushed garlic, kosher salt, pepper, olive oil and "Kicker." The specific recipe for the wet rub is below. Now, let's discuss how to cook prime rib outdoors. Prime rib is also known as "standing rib roast." The reason for this is that the meat "stands" on the ribs in the roaster or on the grill while it is cooking. While you can purchase a prime rib without the rib bones known as a "rolled rib roast," I would not encourage it. The ribs add great flavor and some of the best meat is still hanging on the ribs when you cut the ribs out. I like to cook my prime rib to roughly 125 degrees Fahrenheit. This is considered "medium rare." Plan on 20 minutes per pound at 350 degrees Fahrenheit. Great sides to go with the prime rib are creamed spinach, creamed pearl onions, glazed carrots, any sort of potato and sautéed mushrooms. Want to do something special with your leftover prime rib? 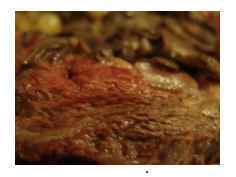 Click on this link to see how I blacken prime rib. When cooking on a charcoal grill, here are some hints that will help you. Use a Weber: For charcoal grilling, this is the best design out there. Size of the Roast: One bone usually feeds two people. I always get more than I need because the leftovers are so awesome. Dry Age: Depending on how much time you have, you can increase the flavor by letting the roast sit in your fridge uncovered for up to a week. This increases the intensity of the flavor. Temperature of Meat: Let the rib roast come to room temperature prior to cooking. This can take an hour or two depending on the size of the roast. This will cause the roast to cook evenly. Preperation of Grill: Use indirect heat, and place roast in a disposable pan for cooking. Use of Thermometer: Treat yourself to a wireless electronic thermometer. I use one in the video and and frees you up to spend time with family and friends while the roast is cooking. Let It Rest! : The fluids inside the roast need to relax. The heat has them moving around like crazy, and if you cut into the roast too soon you will lose a lot of juiciness as it flows out of the meat. Let it rest for 20 minutes or so before carving. Carving: You can carve out the ribs first, which will allow you to determine the thickness of the slices much easier. DO NOT throw away the bones. Serve them as well, as the flavor around them is spectacular. Do you have a question for Dave regarding this recipe or anything relating to grilling or Barbecuing? Ask him personally by Clicking Here. You will hear from him within 24 hours, probably sooner. Sign up below to receive my monthly email newsletter, "The BBQ Gazette." I will be covering BBQ and grilling techniques, BBQ gadgets, grills, recipes, sauces and rubs and much more. This is a very traditional and simple rub for prime rib. Typically nothing complex is needed for dishes as rich as prime rib. The rub becomes a crust and provides a great contrast of flavor and texture to the silky smoothness of the meat. 1/2 Cup of Prepared Horseradish: This is the kind that has some mayo with it. 1/2 Cup of Kosher Salt: DO NOT use table salt. VERY important. 1/4 Cup of Coarse Black Pepper: Again, texture is very important here, and fresh cracked is even better. 1 Teaspoon of Fuzzy's "Kicker": Adds a little heat and depth. It is traditional to serve the prime rib with a horseradish sauce on the side. This is very simple and a great compliment to the meat. Leave How to Cook Prime Rib and Return to Beef Recipes.